Put down your credit for a moment and understand that collecting vintage tech is very much a seller’s game. Apple has a very loyal brand community and a culture of collectors who will devote life savings and decorate their homes with all things Apple. There’s no limit to what the owner of a particular Apple item can ask. Consider that a ratty pair of Birkenstock sandals that once belonged to the late Apple co-founder Steve Jobs sold at auction last year for an undetermined amount. Bidding began at $850. Just this week, a pair of Apple tennis shoes from the 1990s, a prototype pair when the company considered going into the shoe business, was presented as part of an auction catalog. The shoes are expected to fetch as much as $30,000 at the sale on June 11. But that’s a prototype and a completely differently subculture of vintage tech and probably a hobby that would make your financial advisor frown. Eve prices on legitimately valuable items change all the time. The rare Apple 1, the very first computer made by Jobs and his other co-founder, Steve Wozniak, sometimes flirts with the $900,000 mark and sometimes comes in at less than $200,000. The seller of the iPod boombox, theappleipodpay, bills it as “AMAZING RARE” because it is still in the box and factory sealed. Boxed and sealed items, especially, iPods and iPhones do fetch higher prices, but these tend to be all over the map as well. Never-before-opened Apple items seem to be the specialty of this seller. Last year, theappleipodbay listed three first generation iPod Classics inbox and factory wrapped for $50,000. 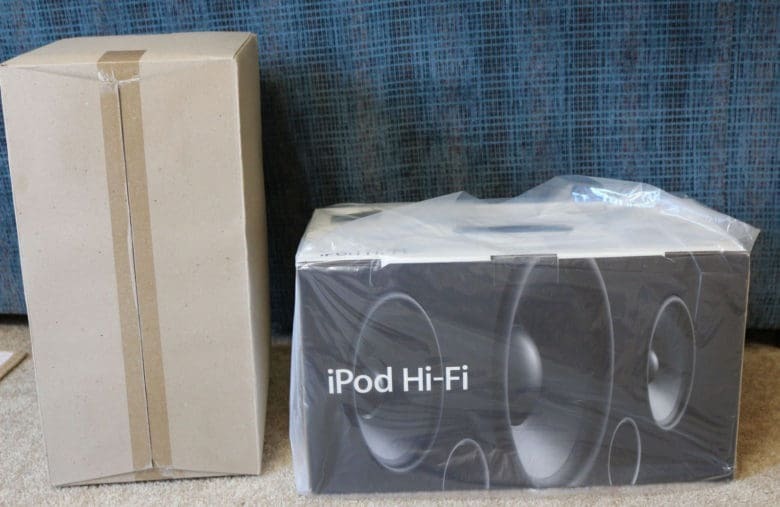 They are no longer on the seller’s eBay store page, but there are plenty of other sealed Apple products, including old iPods, selling for a few thousand dollars. Scroll down that page and one with the same claim, boxed and factory wrapped, has a “Buy it Now” price of only $500. There are 27 watching this item and this seller, garmont2222211, has a 100 percent positive feedback rating. That may even be considered outrageous but if you have to have it, $500 seems thrifty. If you your Apple item has to be virginal, you’re at the mercy of a more ruthless kind of seller. If you just want to check out the sound quality, there are used ones online for a couple hundred bucks or less. 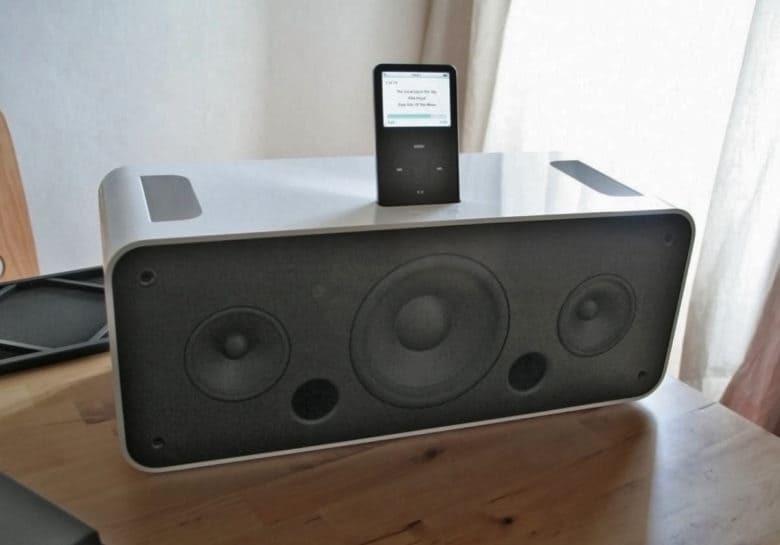 Before there was a HomePod, there was the iPod Hi-Fi Boombox. Single-speaker audio has probably come a long way since the iPod Hi-Fi Boombox and so it probably wouldn’t be much competition for Apple’s upcoming HomePod. PCmag.com in 2006 was impressed with the sound quality “capable of powering a serious party”, but still no match for high-end, floor-standing speakers. The iPod Hi-Fi had other problems. The price, $349, was more expensive than other dock-speaker devices on the market. Not all iPod models were compatible and an adapter had to be used to charge newer iPods. It also lacked an AM/FM radio. You remember those.